Just outside of Normangee, Texas, Harding Directional Drilling was in the middle of a gas pipeline installation project. The pipeline was in a dry low lying area near the Navasota River. They had worked in the area for several weeks and had already installed more than 5,400 feet of casing ranging in sizes from 20" to 36" in five pulls. The project was on schedule and going well, little did they know that Mother Nature was about to pitch them a curve ball that no one was expecting. In the first week of June, Harding Directional had nearly completed the installation of a 2,800 foot section of 36" steel casing. Heavy spring rains began and Harding was forced to halt construction. Within a few days, the weather service warned that flooding was expected within the Navasota River basin . The river was expected to crest and flooding expected to be nearly 3 feet by June 10th. Harding Directional and WILLBROS RPI (General Contractor on the project), moved their equipment to the highest ground possible. On the morning the river was expected to crest, the contractors witnessed Mother Nature at her angriest. The area flooded to depths of 6 - 10 feet and the river was still rising. "The rig side was on relatively high ground; however the pipe side was a different story. Water levels had risen up so high that only the operator's cabs were visible on our large excavators," said Robert Hamilton of Harding Directional. "A job of this scope is something that Harding Directional will do any day of the week," said Hanson Turnbull of Earth Tool Company LLC (Earth Tool). This job was different. Because of the delay of the project, deluge of rainwater and the sugar sand material that they were boring through, the bore collapsed and stuck the casing. With the hole collapsed, the massive 680,000 lbs of pullback force their rig produced, wasn't enough to finish the bore. Hamilton contacted a local authorized dealer to analyze options for completing this complicated bore. A call was made to Earth Tool, manufacturer of HammerHead Trenchless Equipment and a plan to use HDD pipe ram assist was put into place. Pipe ramming is a technique that is frequently used to install various sized casing for a variety of utilities. The process simply described is a non-steerable system of forming a bore by driving an open-ended steel casing using a percussive hammer from a drive pit. The soil may be removed from the casing by augering, jetting, or compressed air. Pipe ramming technology has been identified as a useful tool in helping complete stuck or hydrolocked directional bores. The method is commonly referred to as "Pullback Assist" and has been successfully used on steel pipe as well as HDPE. In anticipation of problems, the method is viewed by many contractors as a safety measure. "When problems arise on an HDD project, quick reaction time is a critical factor with any HDD assist method and the rate of success improves the quicker problems are responded to," said Jeff Wage of Earth Tool. 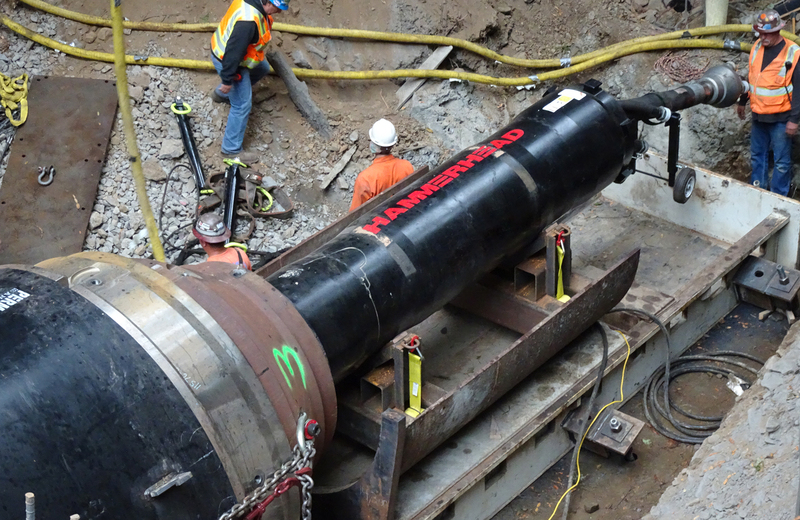 To assist the pull back, Earth Tool suggested a 24" HammerHead Mole® pipe rammer be used to save the bore. Earth Tool recommended the 24" rammer because of its massive impact force of 2,000,000 lbs when traveling at one foot per minute.